Zach Bain grew up on a family farm and he was always extremely passionate about environmental issues, knowing it would be a long-term goal to have his own farm one day. When he realized about a year and a half ago that he needed something more fulfilling in his life, Zach launched his first farm, a hydroponic business in Lowell, MA called Lowell Lettuce. While Lowell Lettuce has been a great success, Zach also wanted to have a more traditional production, deciding to participate in New Entry’s Farm Business Planning Course in the fall of 2016. New Entry gave him the leg up he needed to start another small farm business, Bad Rabbit, at New Entry’s incubator Ogonowski farm sight in Dracut, MA, with its first season being the spring of 2017. Zach graduated from the program in December 2016. 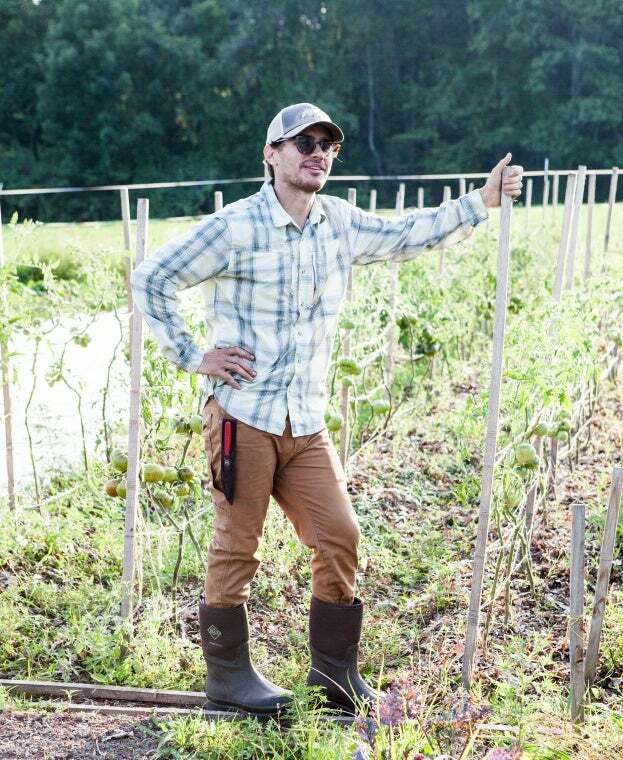 Because he grows primarily leafy greens, such as miniature head lettuces, salad mixes, and kale, at his hydroponic farm, Zach hopes to produce a wide variety of vegetables typically seen at a farmers’ market, including tomatoes, cucumbers, eggplant, etc. His plan is to grow roughly 20 to 25 different vegetables at Bad Rabbit, which is currently a quarter acre. Zach hopes to continue maximizing his production within this acreage in the next couple of years, holding off on expanding the farm’s size until he has a better sense how managing the first few years will pan out. Though he had a background in farming, Zach highly values the education and skills he received from New Entry, most of all prizing how the initiative connected him to the farming community. Sharing similar dreams and passions with others has assisted Zach in making his farm a reality, believing that without New Entry, he would have had to hold off on starting his in-ground business for several more years. He feels New Entry also supports new farmers looking to enter the local food system, noting that there should be more of an emphasis on the local food market as greater uncertainties about the environment and the economy arise. With this idea, he pulls from his mission statement, claiming that he is “really attracted to the land stewardship side of farming.” Small farmers have the ability, and even the responsibility, to leave their land in a better condition than when they started farming. While he states that sometimes the income from farming may not be high, the reward he receives form properly caring for the land makes his occupation completely worthwhile. Multitasking is certainly one of Zach’s strengths, operating not only two different farming businesses mostly on his own but also working as a marketing consultant. Zach explains that there is no simple answer to successfully starting a farm business. It is necessary to know that starting a farm is a process, making sure to prioritize what is really important. “The biggest thing is to be kind to yourself.” Accepting that making mistakes is a natural part of the farming process will allow for greater successes at the end of the season. Bad Rabbit Farm is located on 100 Jones Avenue in Dracut, MA with Lowell Lettuce located near downtown Lowell, MA. Be on the lookout for Bad Rabbit Farm’s website that will be live soon.